New technologies help decision makers gain insights from all types of data — from traditional databases to high-visibility social media sources. Big data initiatives must ensure data is cost-effectively managed, shared by systems across the enterprise, and quickly and securely made available for analysis and action by line-of-business teams. 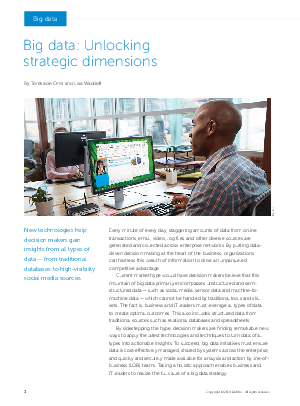 In this article, learn how Dell working with Intel® helps IT leaders overcome the challenges of IT and business alignment, resource constraints and siloed environments through a comprehensive big data portfolio based on choice and flexibility, redefined economics and connected intelligence.